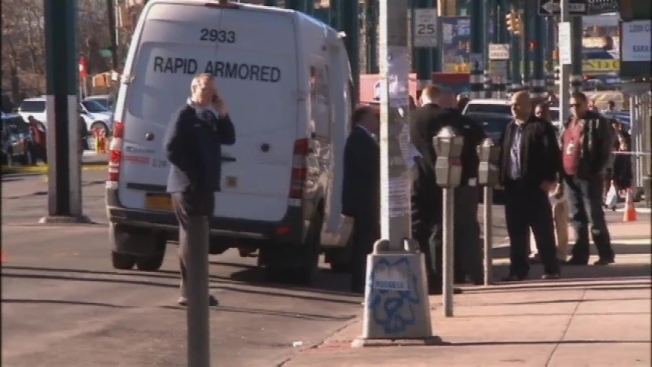 Authorities are continuing to search for the suit-wearing robber who hit an armored car in New York City on Tuesday and got in a gunfight with the men guarding the cash-filled vehicle. Police released an image of a red Honda Accord believed to be used in the heist in the Bronx's Soundview neighborhood. Authorities say the bandit approached the armored car while it was parked on Westchester Avenue, pulled out a gun and demanded money from a guard loading about $78,000 into the cargo hold. The robber then traded fire with the guard and a second one who was in the vehicle. As the guards, still firing, drew back for cover, the man in the suit grabbed bags of cash and ran off. A block away, he jumped into the red Honda and the vehicle sped away, police say. Anyone with information about the heist should call Crime Stoppers at 1-800-577-TIPS.